John Fuller commissioned Chantrey to sculpt a bust to be placed in St Thomas church in Brightling. Completed in 1819 it shows Fuller in a "Romanesque pose" complete with toga. "Beneath this is a plaque by Henry Rouw with the inscription: 'Utile nihil quod non honestrum'--Nothing is of use which is not honest. The choice of Chantrey to make the bust yet again illustrates how Fuller's great wealth enabled him to employ the very best of craftsmen." John Fuller: Squire of Brightling by G. Huchinson, pp 94-95. 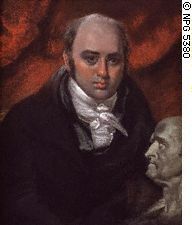 ​In 1832, Fuller presented a similar bust to the Royal Institution. It seems that Chantrey never forgot his humble origins. He was known as an animated raconteur who used strong language. He believed that art was for all people to appreciate and enjoy and not to "baffle or patronize the layman". Francis Chantrey Sculptor: From Norton to Knighthood, by S. Dunkerley, p 114. 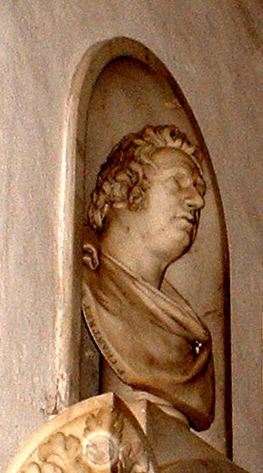 Chantrey sculpted memorials to some of John Fuller's relatives including Rev Stephen Sloane in St Nicholas Church, North Stoneham, Hampshire; Lt. Charles Baldwin Dyke Acland RN, died 1837 and Capt. Charles Richard Dyke Acland RN, died 1828 whose memorials are at All Saints, Selworthy, Somerset. Born at Norton, Derbyshire, Chantrey was initially apprenticed to a wood carver and gilder named Ramsay. John Raphael Smith, the prominent mezzotint engraver, was a frequent visitor to Ramsay's shop. He gave Chantrey drawing lessons so Chantrey started to paint portraits. In 1809, he exhibited a Head of Satan at the Royal Academy, which led to commissions to make busts of Nelson and other admirals for Greenwich Hospital. Chantrey married his cousin Ann Wale whose dowry of £10,000 allowed him to establish a good art studio and purchase several houses. Chantrey achieved his first major success with a bust of the radical reformer, John Horne -Tooke (1811), and thereafter received commissions for portrait busts, monuments and full-length statues, including George Washington, Boston, USA (1826), William IV, Trafalgar Square (1829), and Sir Thomas Munro, Madras (1838). Among his many public sculptures are the Sleeping Children (1817) in Lichfield Cathedral, William Pitt in Hanover Square, George IV in Trafalgar Square, Queen Victoria in the National Portrait Gallery and George Washington at the Boston State House. 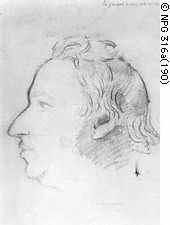 Elected Associate Royal Academician in 1815 and a fellow of the Royal Academy in 1818 Chantrey, exhibited at the Royal Academy from 1804 to 1842. 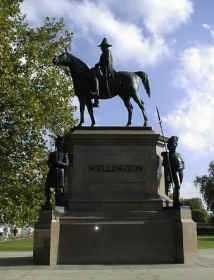 He was knighted in 1835. In his will, Chantrey bequeathed the Royal Academy £ 105,000 which was a vast sum of money In 1875. This was invested by five trustees, and the income each was to be used by the Academy to purchase works of art - painting and sculpture - executed within the shores of Great Britain. The idea was to build up a national collection of British art.